So you’ve bought a bunch of apps, perhaps its a good time to organize them. There are many ways to do this. A couple include using iTunes or physically dragging apps around on your iPad. To rearrange apps on your iPad, touch an app and hold down until the app icons jiggle. Then, arrange the icons by dragging them. Press the home button to save your arrangement. If you have many apps, you can arrange and create up to 11 screens or pages. The dots above the Dock show the number of screens you have and the white one shows you the one you are currently viewing. For apps you use frequently, you can create a shortcut by making those apps available on every page. Tap and hold an app. When they start to jiggle, drag the app or folders of apps to the bottom of the screen (dock). This will allow you to find an app quickly, no matter which page you are on. To drag a folder into the dock, you will have to create it first on the screen, then drag it to the dock. You can organize your apps via iTunes if you prefer. Launch iTunes and connect your iPad. Select your iPad and tap Apps. You will see your apps and the different pages on which they appear on your iPad. Select an app and drag it to a different page to move it to that page. You can create folders the same way by dragging an app into another app. iPad automatically names a folder when you create it based on the icons used to create the folder. You can change the folder name by tapping the x and typing a new folder name. You can put up to 20 icons in a folder. To get rid of the folder, drag the apps out to the desktop. There are many ways you can arrange your apps including by location, alphabet or categories. To arrange your apps alphabetically, on your iPad, tap Settings > General > Reset > Reset Home Screen Layout. This will make your first page default to the original Apple apps. Beginning on the second page, your apps will appear alphabetically. You will have to do this each time you add an app to keep it in order or you can rearrange them after buying new apps. Apple has currently listed 20 categories of apps. Perhaps you can create a folder for each category and arrange your apps accordingly. The 20 categories (in alphabetical order) are: Books, Business, Education, Entertainment, Finance, Games, Healthcare & Fitness, Lifestyle, Medical, Music, Navigation, News, Photography, Productivity, Reference, Social Networking, Sports, Travel, Utilities, Weather. There are many ways to organize and make your iPad your own. When you have begun accumulating apps, take a little bit of time to organize them. A little time spent organizing can well save time and increase your productivity. Next Post Noterize Note Taking App – Free Right Now. is there a way to set the ipad to automatically create folders and dump the apps directly into a predefined Apple folder? Or, must you manually move the apps into a folder you create? I know of no automatic way. You can drag and drop on the iPad or using iTunes when your iPad is connected. At the moment I have 1336 apps in my 64GB iPad & sorting them into folders is a real pain & time consuming esp after a fresh system restore. I wish Apple or someone will come up with a tool or an app to automatically sort them into folders based maybe on the AppStore categories. Nice tutorial… my problem is I put the apps away in a bunch of folders… I have two pages full of folders on my iPad… now I want to find an app that I put somewhere…. but I can’t remember which folder!? AH! So, now I have to look through each folder to find the app… I know I can use “search” to find out the app and run it… but it wont tell me where I put the app! Anyone with any tip here I am missing?! I hope apple puts some better app organization tools into the next version of iTunes. No reason not to put in some tools to auto organize alphabetically or by function or by date or etc., etc. etc…. The Newstand app on my iPad2 refuses to go into any folder. None of the other icons seem to have this problem! I never noticed that before. It does that on my iPad as well. You can move Newsstand to the shelf at the bottom. That is the “correct” function… the newstand is a special app that can not be put into a folder! It seems to be the ONLY app that is so “special.” Everything else will go into a folder. Even the app store and the calendar can be moved. Kind of annoying. Thanks for your quick responses! You can put it in a folder, but it takes some doing. Google it. Newsstand itself is actually a folder. It holds magazine apps. I agree it’s annoying. I don’t use it very much. Organization is the real bugaboo of the Ipad and iPhone. It needs a launcher so screen can be cleared of apps. Very distracting not to mention confusing. I’ve sorted my apps into folders. How do I get the folders to move onto other screens? First, touch and hold an app. The apps will begin to “jiggle.” Lift your finger. While the app is still “jiggling” touch and hold the app and drag across to the screen and location where you want it. I think Susan is asking how to move an app or folder to another screen/page. the iPad doesnt seem to let you do that unless using iTunes. No, that is currently not possible without a jailbreak.remember, iOS is far more limited than Android is. Apple is very restrictive. Thanks this really helped. Im getting an ipad 3 in a couple of weeks and ive read over 100 pages of information. Newstand can be placed in a folder. Merge any 2 apps and as they merge to form a folder QUICKLY slide in Newstand. Might take a few trials, but it works. Good stuff! One more question, how do I move an app from one page to the other?? I was frustrated like many other folks. Because of this article & blog I decided to check out the I-tunes site on my PC. Once there, under the “Library” list on the left I clicked on “APPS” (530 total). I noticed in the center at the top of the Apps page to the right of the highlighted word “APPS” is the word “GENRE”. Click on that & it groups ALL your Apps into the 20 different categories (as mentioned by Justin Kahn in the article). Each Genre (category) showed how many apps I had in it. By double clicking a genre it opened a list of ALL the Apps that was in it. YIPEEE!!!!!! At least now I can print each genre list & go to my i-pad 3 to know which app should go to which genre (category). I ALSO noticed that on my PC in i-tunes each app had a genre listed below it BUT NOT ON MY I-PAD3… They DON’t tell you the genre below. I was opening each one to figure it out! (I probably downloaded 25 – 50 apps at a time & unless the app title was specific I couldn’t remember what they were for.) THIS WILL MAKE IT SOOOOO MUCH FASTER!!! After I sort them by the 20 specified genres I may add a couple of my own (or add extra words to the original genre titles). Drag app to either previous or forward screen border and wait there a second and screen will change . Swipe all the way to the left. Enter the name of your application in the search field. You will be provided with a list of choices. Try that as the shortcut. thanks, but I still don’t know where the app is located – I have 1800 apps over 11 pages with 15 folders or more on a page – see the dilemma? Thanks! I think you can plug the iPad into iTunes like you are going to sync and type in the name of the app. It will show you which page it is on. How do I stop my carefully arranged apps from being rearranged (and moved back to the first screen!) every time I either sync my ipad3 to iTunes or power it on after recharging? Hello Everyone, today i am going to teach you how to put newstand in a folder. Step 3: Drag app 2 into app 3 to make a folder, but when they merge into a folder QUICKLY hold newstand with spare finger. Step 4: Newstand falls into folder from random space. Step 5: Remove apps 2 & 3. -You now cannot open newstand in a folder, unless you remove it from the folder (It will crash your iPad). 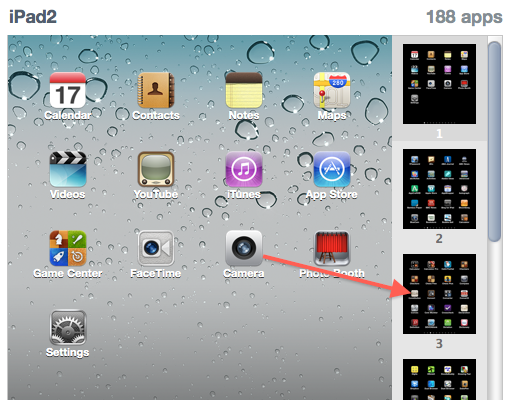 Where is area of iTunes 11 that is for arranging the icons on each page on either an iPhone or iPad? I can’t find it like iTunes 10. Thanks. Where are all the end of the alphabet apps gone. 11 pages take me to the I’s and no app with M, O etc anywhere to be found! You need to go to the “Search” page to open it. iPad only supports 11 page views, but it is still on your iPad. Once you open it, you can reopen it on your multitasking bar below. Pingback: What should every teacher in the 21st century know and be able to do? why would anyone need 1800 apps.? Most people don’t have that many apps. Tap and hold on the app. Apps will begin to jiggle. Tap on the – and the app will be deleted.